Moldavite is the only known "gem quality" green stone of extra-terrestrial origin. Moldavite was produced from a meteor collision that fell over the Moldau river valley in Czech Republic over 15 million years ago. 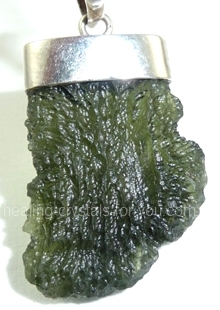 Even people not sensitive to the energies of stones, often feel the energy of Moldavite. Many sense it as heat, tingling or pulsing sensation in their hand. Moldavite may be used to open up the chakras. Wearing it helps manifest positive life change. Moldavite is found in only one area of the world. A meteorite of enormous size and incredible impact is known to have crashed in the Czechoslovakian mountain region around 15 million years ago. Advice is given to people to use it sparingly until you get used to it. But often it is hard to put aside once you have experienced it. I personally went to buy myself a second piece recently, in this case I was drawn to a faceted Moldavite ring . As soon as I was handed the ring I felt an immediate tingling in my hand. Then a feeling of dizziness and a heat flush of intense proportions went through my body. Great gem for luck, health, prosperity, power and spiritual contact. To get one contact us.